BROADFORD donated the Glenomra Shield for the first Clare senior camogie B championship but they never looked to be capable of bringing it back home after this one-sided final. Despite notching the first point for play courtesy of Regina Durack in the second minute, Broadford were well and truly crushed by a very clinical Clooney-Quin, who produced a scintillating display of textbook camogie to finish convincing 21-point winners. In fact, Clooney-Quin could have even qualified for the knockout stages of the senior A championship if they had produced this type of performance earlier in the year. Pre-match expectations of a close game didn’t materialise as Broadford never produced what they are capable of in some of their earlier games. In fact, it is hard to explain how flat Broadford were on the day. Clooney scored a narrow win over the East Clare women in a challenge game earlier in the season but Broadford played a lot of games since then and were hoping to reverse that result. Broadford also had a slight edge in match practice having beaten Wolfe Tones on a 4-8 to 2-4 scoreline in the semi-final, while Clooney got a bye from Bodyke at the corresponding stage. Those involved in the promotion of camogie in Clare hope that the Glenomra Shield, which runs in conjunction with the senior championship, will provide the vital stepping stone necessary for the transition from intermediate to senior ranks and help improve the overall standard in future years. Winning a piece of silverware will certainly give Clooney-Quin a lift and they have the potential to make an impact in the senior A series if they can perform with consistency. This was the first time this year that the winners had a full deck to choose from and it showed. Their defence was rock solid throughout with a series of very good displays from captain and wing-back, Imelda Colleran, Aishling Hannon and their entire full-back line, who limited their opponents to just a single point. Orla Duggan worked hard at midfield and also managed to link up very well with her forward colleagues scoring an impressive 1-2. The star of the show was Clare senior, Deirdre Murphy, who led by example from centre-forward. Despite missing a few chances, Deirdre never let her head drop, kept working hard to create scores and was a constant thorn in the Broadford rearguard. The addition of Claire Ryan from Kilkenny has been a huge boost. She proved to be an ideal target woman notching 2-2 and any time a goal chance presented itself, she had the confidence to have a go. Conceding three first-half goals sealed Broadford’s demise and ended the game as a contest by the interval when they trailed by 3-6 to 0-1. In the fifth minute, Claire Ryan burst through on a solo run and blasted the sliothar to the back of the net. She followed up with a point to leave Clooney-Quin 1-6 to 0-1 ahead after six minutes. Broadford were winning possession thanks to the hard work of Patricia and Stephanie Moloney, Regina Durack and Siobhán Kiniry, but couldn’t convert this into scores. Aided by a stiff breeze, Clooney-Quin continued to grow in confidence and received another massive boost when a long delivery from Orla Duggan deceived the full-back line and fell to the on-rushing Mary Clune, who made no mistake to put the winners nine points ahead after 19 minutes. Deirdre Murphy fired over a great point from play and converted a free before Orla Duggan grabbed a well-taken goal following an inch perfect pass from Marie Begley. On resuming, Broadford needed to score a goal early on to make the scoreboard look more respectable. Instead, Mary Clune increased Clooney-Quin’s lead while Sheelagh Daffy did well to parry a goal attempt from Stephanie Moloney. Another opportunist goal from Claire Ryan after Deirdre Murphy’s earlier shot was saved in the 35th minute put the contest way beyond Broadford’s reach at 4-8 to 0-1. It took Broadford over 34 minutes to register their second point from Leah O’Keeffe and further white flags from Regina Durack and Stephanie Moloney in the 44th minute barely raised a cheer. Deirdre Murphy continued to punish Broadford’s indiscipline by converting three frees while Claire Ryan crowned the rout with a point five minutes before the end. Clooney-Quin: Sheelagh Daffy; Triona Gallagher, Amy Colleran, Christine Colleran; Jessica O’Neill, Aishling Hannon, Imelda Colleran (captain); Kelly MacLean, Orla Duggan; Marie Halpin, Deirdre Murphy, Karen Riardon; Marie Begley, Claire Ryan, Mary Clune. Scorers: Claire Ryan (2-2), Deirdre Murphy (0-8, 0-5 frees), Orla Duggan (1-2), Mary Clune (1-1). Subs: Gráinne Larkin (51 mins) for Marie Halpin, Jane Seward (52 mins) for Christine Colleran, Gemma Hassett (54 mins) for Marie Begley, Saidhbhe Corbett (56 mins) for Karen Riardon. 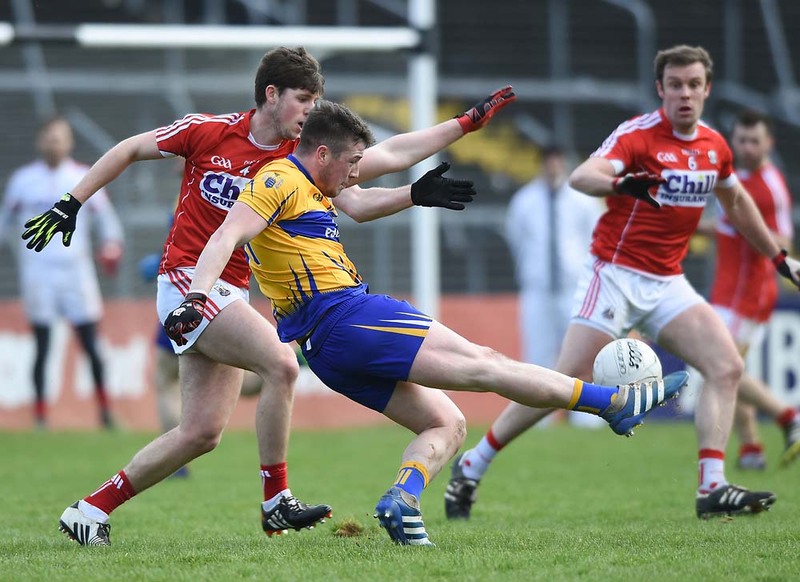 “Clooney-Quin got a few early scores that took the sting out of Broadford, who never got going on the day. This was the first time this year, Clooney-Quin had a full panel of players. We were missing three of our best players against Newmarket and players weren’t fully tuned in against Sixmilebridge. Last year, Clooney-Quin lost to Kilmaley by a point and we only started to get things together in the last three weeks. We are delighted to have some silverware after the year and hope to make an impact in the senior A series next year,” Clooney-Quin manager, Michael Murphy. Broadford: Maureen Casey; Sarah Doyle, Marie Corcoran, Deirdre Boland; Catherine Corcoran, Danielle Sheedy (captain), Patricia Moloney; Sarah Skehan, Stephanie Moloney; Regina Durack, Siobhán Kiniry, Jennifer Moloney; Gráinne Corry, Caroline Fortune Moloney, Leah O’Keeffe. Scorers: Regina Durack (0-2), Stephanie Moloney (0-1), Leah O’Keeffe (0-1). Sub: Aisling McNamara (38 mins) for Sarah Doyle. “We were very disappointed with Broadford’s performance. The concession of three goals in the first half left us with a mountain to climb. The girls battled until the final whistle and did their best but things didn’t go their way on the day. Overall, we were happy enough with the year,” Broadford manager, Eugene Moloney.